We met with Duncan Gordon – Director of Corporate Affairs for Pepsico who are Walkers parent company, at their offices in Soho in London. The Walkers bosses listened carefully to our concerns and discussed several things they are doing right now to attempt to hit their 2025 deadline. They promised to release an official statement in response to the petition tomorrow, for 38 Degrees to share with petition signers. 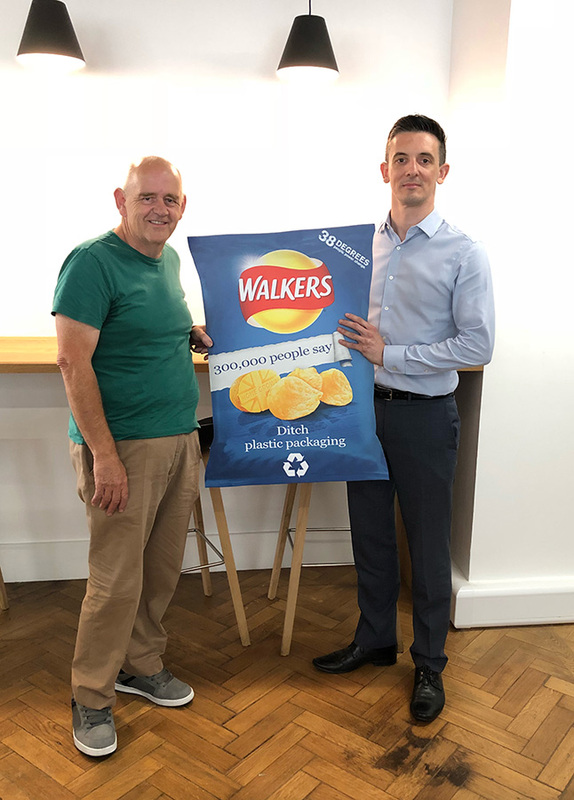 Geraint told the Walkers Directors how he’d started the petition because, like many other people, he’d initially assumed that their packets were recyclable. He was shocked to learn that millions of packets were ending up in landfill, littering streets and polluting our oceans every day. So he started a petition and soon hundreds of thousands of people joined him. 98% of people thought that Walkers 2025 pledge to phase out plastic was either not ambitious enough or simply kicking the problem down the road. 81% said that they’d be happy to pay a few more pence for their crisps if the packets were made recyclable or ideally compostable. We hope that this statement will be as ambitious as possible, and that they will commit to phasing out the billions of plastic packets they produce each year much sooner than 2025. We want to see real progress being made on the issue, and on the impact of the waste that they currently produce.